I find different kinds of joy in both big and small stitching projects, different kinds of satisfaction. My new Pond quilt, named for the wavy lines and flowers, which in this context, look to me like water lilies, was a quick, fun quilt to make, that was finished before I grew tired of it, and retired her to a tub to wait for my next ping of motivation, like my long term quilts must. I was asked by Dana Willard to use her new line Blush for Art Gallery Fabrics. Dana is a dress maker, and you can tell by the bold, beautiful prints. I want clothes in all of them! I enjoyed the challenge of trying to use these relatively large scale designs in a quilt of small pieces. I decided to go scrappy, because I think it works well with a limited colour palette, and with all that white, I didn't know how much contrast I'd get in set-colour blocks. I settled on the 2" kite shape pretty quickly, because it was perfect for those fun, fussy cut kitties and flowers, and suited the Dutch vintage kind of vibe. But it wasn't until I'd basted a bunch of shapes, and started to play with layout, that I struck upon this design and was completely taken by it! I just love the navy flowers and how they stand out and demand your attention because they've been cut intentionally. I think it would be easy for this quilt to look messy, but the complete flowers and cats give places for the eye to rest. And that makes me happy. Very happy! The top only took me a week of afternoons and evenings to stitch together. And then I quickly machine quilted straight lines, and bound her in Art Gallery's Pure Essentials in Crystal Pink. The backing is from Anna Maria Horner's Loominous 2 collection. Isn't it perfect! 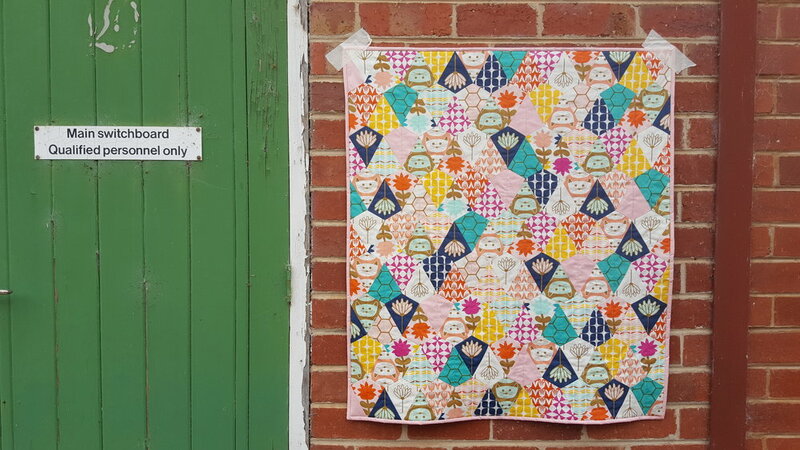 Having almost finished my Ice-Cream Soda Quilt, which has taken me a whole year, making a wee baby quilt was such a delightful change! Not quite the same level of elation and achievement which come from finishing something big and important. This was joy that was more whimsical and easy. A quick fling. I think I'll be making more in the future! It's a great way to get simple ideas out in the flesh. I written up a quick pattern here. You can buy 2" Kites here, and the Acrylic Template here!